Hei, leimattuja ja kohokuvioituja ruusuja, itsetehtyä kohopastaa, vesiväritystä - siinä ainekset tähän korttiin. 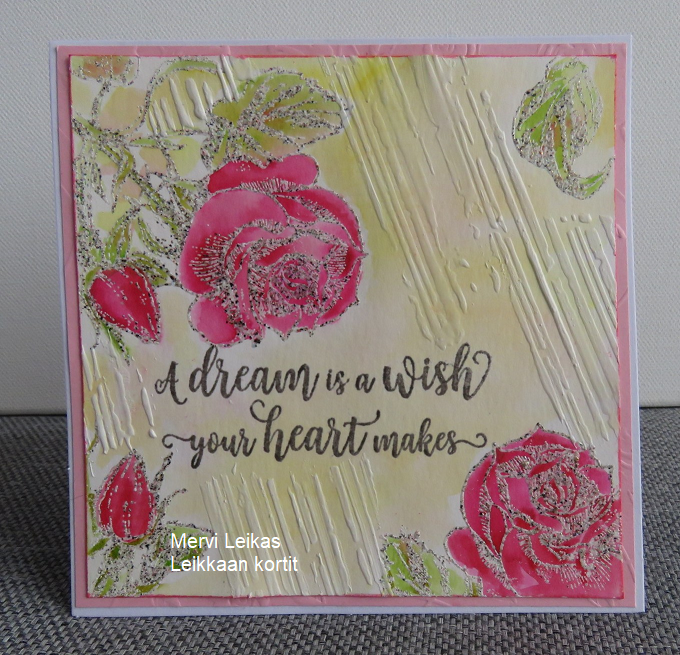 Hi, a rose card made with Penny Black stamps (red blush and happy wishes), stamped with embossing ink and "my own mixed embossing powders", coloured with Distress Inks. In the background I used my own homemade textured paste, just draw some lines with stencil. Super background and lovely flowers. Gorgeous card Mervi! It's so pretty and I love the embossing and the texture paste, they look wonderful.